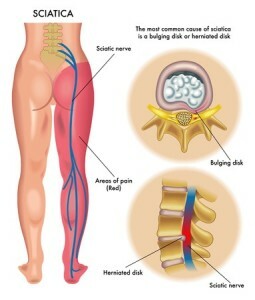 Sciatica is a painful condition that occurs as the result of compression or other disturbances to the sciatic nerve, which originates in the spine and branches off into the buttock, thigh, leg, and foot. Each branch creates an individual root in these areas. The roots come together in the piriformis muscle, which is located in the buttocks. The resulting bundle is what is referred to as the sciatic nerve. This area is extremely sensitive because problems affecting the bundle can affect any of the connected areas. Most often, compression occurs where the nerve exits the spine or in the piriformis muscle, however, it can occur anywhere within the system. One of the most common causes of compression or irritation of the sciatic nerve is disc injury. Though leg pain is commonly associated with sciatica, there are other conditions that could be responsible. When you visit Denver Physical Medicine & Rehab for treatment of your leg pain, we will work to rule out sciatica, if possible. In many instances, other spinal problems such as herniated discs or spinal stenosis are the cause of leg pain. Regardless of the exact cause of your pain, we will use the most advanced diagnostic technology and treatment plans to eliminate your leg pain. At Denver Physical Medicine & Rehab, we believe in taking a multi-disciplinary approach to treating sciatica. Throughout the course of your treatment, we will use advanced diagnostic tools as well as non-surgical spinal decompression techniques and various other therapies to alleviate your symptoms. When you choose us for your Denver sciatica treatment, you will have access to a comprehensive team made up of chiropractors, medical doctors, and Denver physical therapists. We are dedicated to diagnosing the cause of your pain and helping you through the entire treatment and recovery process. To learn more or to schedule a consultation, please do not hesitate to give us a call at 303-757-7280.